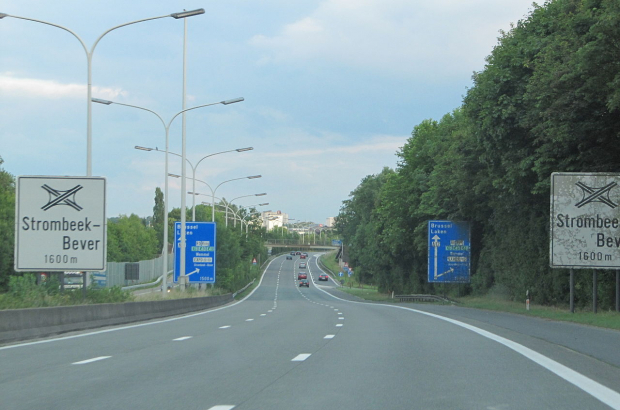 The Brussels government has approved cutting the speed limit to 50kph on two major motorway approaches to the city: the A12 from Antwerp and the E40 from Liège and Leuven. Drivers heading into the capital will have to slow down from 120 to 50 when they enter the Brussels region - at Heysel on the A12 and just before the Woluwe exit on the E40. The motorways will instead be classified as "urban boulevards", according to a decree adopted by the Brussels government last week. Mobility minister Pascal Smet said the number of lanes would be reduced as drivers entered Brussels and new park-and-ride facilities would be built. "The more space we give to cars, the more of them we have," Smet said. "It is necessary to take this step, to transform the motorways that enter our city and to make them urban boulevards." The changes will take two to three years to implement. About 75,000 drivers use these two stretches of road on an average workday. 80 km/h would have been more reasonable. The Minister of Immobility seems to have a free hand in his unstoppable goal of causing traffic chaos, standstill traffic and high pollution rates. Lots of people avoid going into Brussels altogether. Many Belgians live in the suburbs and have to drive to Brussles to work. I have a suggestion to make life better for everyone. Instead of taking away a precious car lane, why not make the third lane "HOV" (high occupancy vehicle) which means 2 or more adults inside. Most cities in the US have this feature for busy rush hours. This will encourage car pooling, reduce traffic but still allow commuters to get to work on time. Brussels has to be open for business, not just for bicycle riders!